Few hours ago, Greenpoison absinthe has been released to jailbreak iPhone 4S and iPad 2 untethered on iOS 5.0.1 and iOS 5.0. 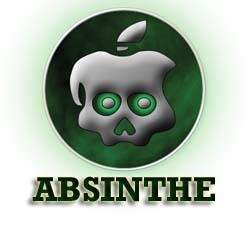 Greenpois0n Absinthe is available now for both Windows and Mac users. Some of Mac users have reported a lot of errors. One of these errors was Error Establishing A Database connections and we showed you how to fix it and the other was camera roll error and it's fix here. 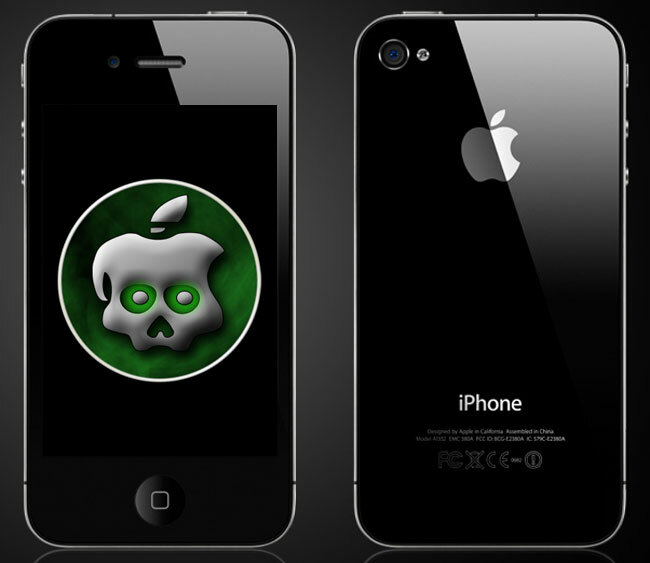 In this post we will show you full guide with video to jailbreak your iPhone 4S and iPad 2 running on iOS 5.0.1 untethered with Greenpoison Absinthe. Finally, P0sixninja the well known hacker and our great warrior behind Greenpoison has released Greenpoison Absinthe 1.2.2 to jailbreak both iPhone 4S [ running iOS 5.0 or either 4S version of 5.0.1* ] or your iPad 2 [ all Wi-Fi only, GSM & CDMA devices supported: must be running iOS 5.0.1* ]. 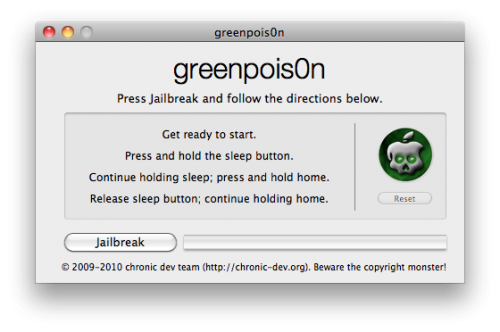 Now you can download Greenpois0n to Jailbreak your iPhone 4S or iPad 2 on iOS 5.0 or iOS 5.0.1 for both Windows and Mac. Download Greenpois0n for Windows and Mac from the links below after the jump. 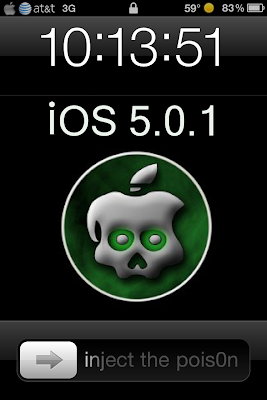 Few hours ago, our developer P0sixninja has released Greenpoison Absinthe To jailbreak iOS 5.0.1 Untethered on iPhone 4S and iPad 2. 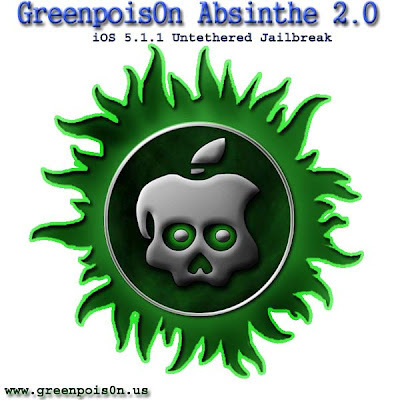 Greenpois0n Absinthe has been released for Mac and it will be available for Windows and Linux in the next few hours. Some of Mac users have reported an Error Establishing A Database Connection When Using Greenpoison Absinthe and we showed you how to fix this error. Mac users have faced camera roll error. Let's check how to fix camera roll error after the jump. Finally, after long time dream team has released Greenpoison Absinthe to jailbreak iOS 5.0.1 Untethered on iPhone 4S and iPad 2. Greenpoison Absinthe has been released this time for Mac and it will be available for Windows and Linux in a few hours. Mac users faced some problems when using Greenpois0n Absinthe. This "Error Establishing A Database connections". To Fix this error, read our guide after the jump. Well, a lot of our fans are asking for Greenpoison jailbreak everyday and i was asked personally " Will Greenpois0n jailbreak untethered iOS 5.0.1 ? " The only one who has an answer for this question is Pod2g. 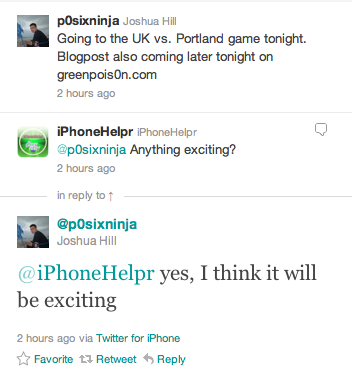 Here's a great news concerning Greenpois0n jailbreak Tool. 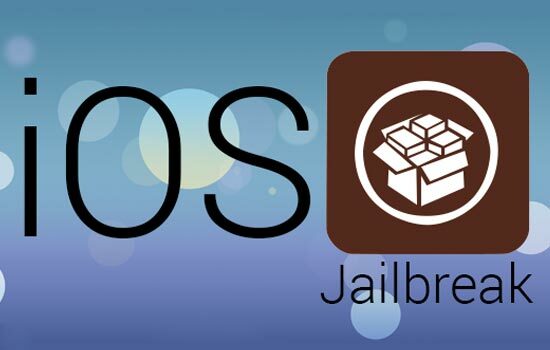 Pod2g has posted more details in his blog about the awaited iOS 5.0.1 untethered jailbreak. 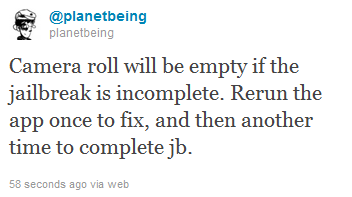 Pod2g declared that he has finished his work with iOS 5.0.1 untethered jailbreak successfully and gave it to Chronic dev-team. Keep reading after the following jump. 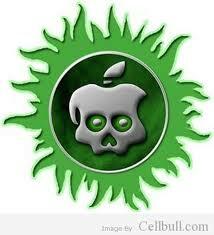 Well, most of you are asking now for Greenpoison jailbreak and if Greenpoison will jailbreak iOS 5.0 and 5.0.1 or not. Few minutes ago p0sixninja the well known developer and the great warrior over Chronic Dev-Team and behind Greenpoison has sent strange and amazing tweet on his twitter account indicating that he hides a surprise and he will push new exciting updates tonight. Read more after the jump. With Chronic Dev Team help we present Greenpois0n RC6.1 for both Mac OS X and Windows. This version has successfully patched with iBooks fix. For who don't know, many users have problems with iBooks after jailbreaking iOS devices with Greenpois0n. 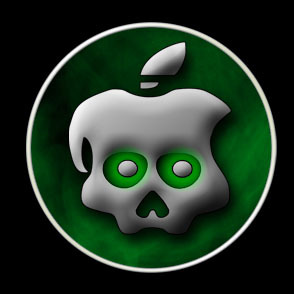 Greenpoison Jailbreak for iOS 4.2.1 Coming Soon Here! We are close from the release of a new version of Greenpoison to support iOS 4.2.1 jailbreak on iPhone 4, 3GS, iPod touch 4G, 3G and iPad. 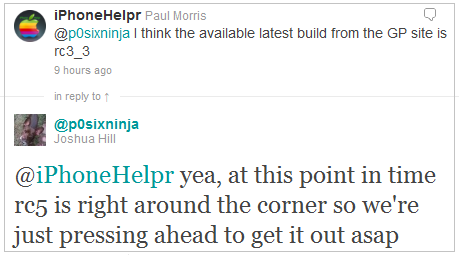 Joshua Hill, the hacker behind Greenpoison jailbreak (Chronic dev-team) has confirmed this on his twitter.